Cooking when guests are over has become tricky with Surya around. She loves to be in the kitchen, clinging to my legs and wanting to be picked up. It’s hard to keep chopping onions when an adorable 2.5 feet tall little cutie pie is dying for you to pick her up and cuddle. So you cave, bend down, scoop her up and try to multitask. The quality of my cooking at this point greatly diminishes. We had friends over brunch recently and one asked if I could make huevos rancheros. It was hard to say no. She said my huevos rancheros was really good. I was a victim of flattery. I knew that with Surya underfoot, I would never be able to make and plate huevos rancheros for all. Plus, I no longer eat eggs so was planning to also make nutella ricotta pancakes in addition, which I needed time for as well. I thought “Why not throw it into a frittata that could go into the oven without much fuss?” What the heck. I figured I would give it a try. Since I’m off of eggs, I didn’t actually taste the frittata. But considering I was barely able to snap one photo of the frittata (which was only being shared by three people), I think it’s a sign that it’s a winner. Frittatas are great for brunch because you can do most of the prep work ahead of time. Cook the bean-tomato mixture ahead of time and mix with the eggs and bake when your guests arrive. 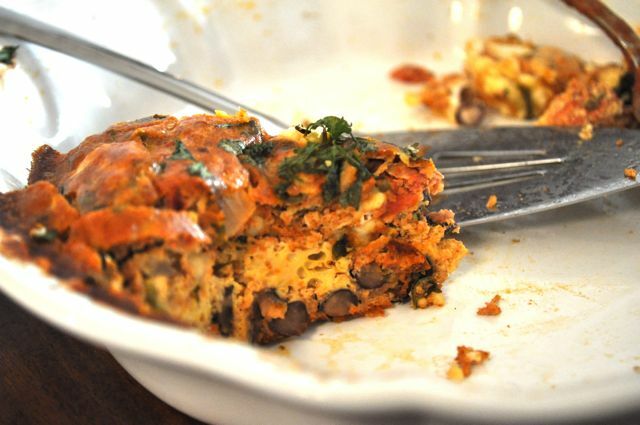 By the time you finish catching up with them, the frittata is ready to serve – nice and hot. 1. Heat about a tablespoon of olive oil in a wide skillet. Add the onion and cook for about 8-10 minutes until glassy. Add the garlic and pepper and cook for a few more minutes until the garlic is soft but not golden. 2. Add the beans and tomatoes. Cook for about 15 minutes on medium heat until the liquid from the tomatoes has mostly evaporated. Stir in the Mexican seasoning and salt (about 2 teaspoons). Stir in most of the cilantro (keep a little pinch for garnishing the top of the frittata). 3. Crack 8-9 eggs in a large mixing bowl and whisk until yolks and whites are mixed. Stir in the bean-tomato mixture, milk and the feta cheese (keep a little feta cheese for garnishing on top of the frittata). 4. Oil a pie dish. Place the dish on a cookie tray and then pour the egg-bean-tomatoe mixture in. This will make it easier to clean up and egg spills. 5. Bake on 350 degrees for about 20-25 minutes until the eggs look set. Sprinkle remaining cheese and cilantro on top and bake for a few more minutes (or turn the oven off and just close the door for a few minutes). Slice the frittata like a pie and serve hot with salsa and tabasco sauce. Also, a little shout out here to Brooklyn Salsa Company. A friend invited us over to taste these a few months ago. I was immediately moved by the fact that they have a curry flavored salsa (interestly called The Bronx and not The Queens). Their salsas are locally sourced, fresh and delicious. My favorite is The Staten Island, Golden Tomatillo Verde. Haha – I enjoyed your story about your child. It is tough for mom’s to multitask – I don’t have one yet, but I’m sure it is a LOT of work and fun too. This dish looks great, I will have to give it a try. Tht looks good… i like huevos rancheros too… and this is an easier recipe too! I’ll bet we could write an entire cookbook called “Cooking With Toddlers”. One with recipes that require only one arm, limited footspace, and very little concentrating. Your huevos fritatta is a brilliant idea. Even if I didn’t have a little one, I’d still make it for company. I like dishes that bake while I visit. I can’t wait to try it. Thanks Anne! That’s a great way to think about it – dishes that bake while you visit. Don’t forget recipes that can be made with a toddler on your hip. made this yesterday for brunch! came out great. definitely an easy dish to put together! Do you think I could bake these in a muffin tin to make individual frittata “muffins” for a larger brunch crowd? Christina, I’ve done that before and it worked perfectly. I used OXO silicone muffin tins. Just be sure to put the muffin tins on a cookie sheet before pouring in the frittata mix to avoid a mess. Avocado tomato melt sandwiches that you can cook with your toddler.